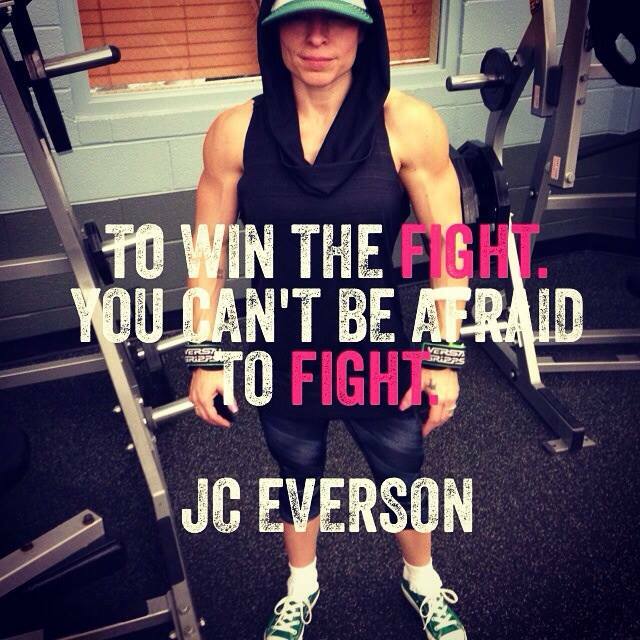 Jennifer Everson | If your dreams don't scare you, they are not big enough. If your dreams don't scare you, they are not big enough. When things are going great, it’s easy to draw from the positive energy around you. But when they aren’t…it’s an entirely different story. You have to find the strength and the courage to continue doing what you know must be done to accomplish your goals and it’s not easy. Some days you will wonder what on earth you were thinking when you set these goals. Some days you will see an easier less complicated path and wonder if you should change your course. The average person will quit the fight. But you aren’t the average person. You must remember your heart lead you to a dream, your mind mapped out your plan, and your body is your instrument. You are stronger than you think and must find the positive energy you need within yourself. Punch negative energy in the face to shut up the doubt, the questions, and insecurities. This is how success is obtained. So repeat after me, “I am a champion”. Now get down to business, focus on what needs to be done today, and do everything in your power to BE the positive energy you need. In doing so, you will make things great for yourself, and you may very well be the positive energy for someone else. This entry was posted in Posts on July 15, 2015 by JCEverson. At the Mid-Atlantic Classic Bodybuilding Show this weekend, I had several friends compete. Although many didn’t place in the top 5 of their divisions, they are ALL winners in my eyes. It takes a strong heart, a fierce mind, and tremendous dedication to even compete. Walking on that stage is YOUR win. This is a tough sport, and you aren’t always going to place high. It is how you deal with defeat that will determine the outcome of your next competition. One of Two things will happen. You will decide it was not as much fun or rewarding as you originally anticipated, and choose not to do it again. Or you will decide you can’t wait until you can get on that stage again, a better version of yourself. 1. Let yourself be sad and disappointed. But do it in private. This is a very important step, you need to let yourself get all of the negative energy out. We are only human. For some this may be a good cry, for others it may be tearing a stuffed animal to shreds with a sharp knife. Whatever it is for you, just do it…and then get over it. Remember losing is part of the game. 2. Lessons learned time. What were the reasons for the loss? Lack of muscular development? To few carbs? Bad posing? Make a list. Look at pictures of those that did win. What do they have that you didn’t. A tighter booty? A better quad sweep? Broader shoulders? Be subjective. 3. Your list from step 2 is now your TO DO list. Working on your physical weaknesses, while not neglecting your strengths. Adjusting your diet. Remember that changes do not happen over night, so make the game plan for the long term gains. Have monthly goals broken down into weekly and then daily goals. All those who have succeed in this sport, have also failed in this sport. But real champions take something away from ALL experiences. Happy Lifting. This entry was posted in Posts on October 27, 2014 by JCEverson. Remember being in elementary and having to do a science fair project? You came up with a hypothesis. A procedure. Ran experiments with controlled test subjects. And then made a conclusion based on your data. Hoping you would get more than a participation ribbon when it was all said and done. Well it’s time to go back to Science Days. Except now I’m the scientist, the test subject, and it’s way more fun because now I appreciate the process! I am currently studying advanced fitness nutrition (thanks to Papi who helped me realize this is my favorite part of competing), and am doing a peak week starting today. There is no contest for me until next year, but I want to see what will happen when I make changes to what I have done in the past for peak week. Working on the little things, makes the biggest differences. And this time the judges are going to be evaluating my finished project. Not my poster progress boards. It should be illegal to have this much fun, seriously…how did I get so lucky? so put on your thinking cap, and learn something new about your body! Happy Lifting. This entry was posted in bodybuilding, ifbb, IFBB PRO, NPC and tagged Ifbb figure, IFBB Pro, NPC, npc figure, peak week on August 31, 2014 by JCEverson. This entry was posted in Posts on July 30, 2014 by JCEverson. I have done many things in my life, I have worn many hats. I used to say that I was a jack of all trades, and a master of none. I always longed to have something in my life that I was so passionate about, I could get lost in it. Something I was so good at…that I would feel like a pro doing it. That there was no denying I was born to do it. I hungered for that feeling of satisfaction in the moment…like what you see on the faces of people in church singing and in their hearts knowing/believing truly they are saved. I woke up this morning, body sore from the past few days of awesome workouts…and I thought to myself, “I can’t wait to workout today”. 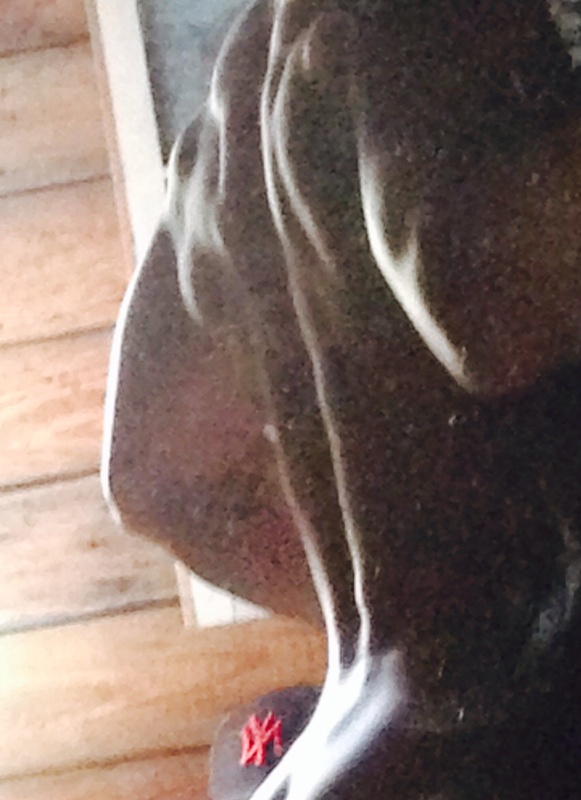 I laughed about a video on Facebook mocking overly enthusiastic muscle heads…because it reminded me of myself. And then I thought to myself about how I feel – happy. Doing what I am suppose to be doing. And I am really good at it. I get lost in my workouts. I am a walking example of my sport, my dedication and effective methods, my art piece. I was born to do this…my whole life of working out, being healthy and active…of eating right; my years of running and chasing happiness. I didn’t realize it until this moment – I have what I always wanted. 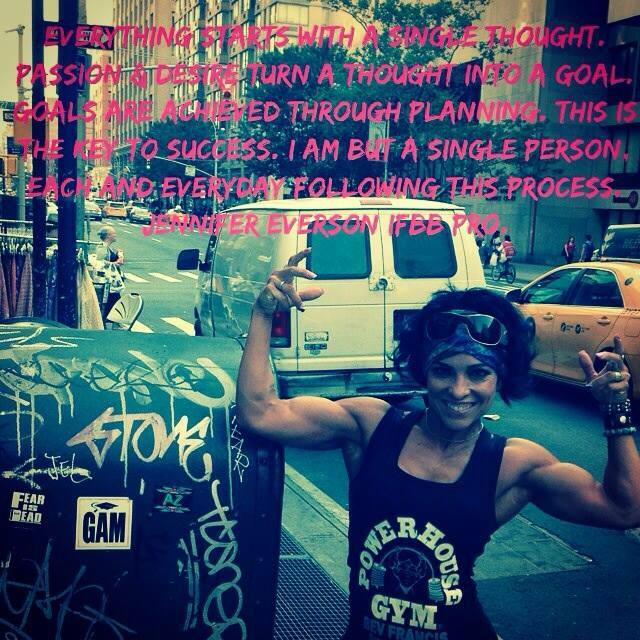 I have had it for some time, it just took me becoming an IFBB Pro to realize it. So with complete and whole hearted commitment to myself and this sport, I say out loud and proud. This entry was posted in bodybuilding, ifbb, IFBB PRO, NPC and tagged bodybuilding, dedication, happiness, ifbb, IFBB Pro, NPC, npc figure, passion, universe, womens bodybuilding on July 17, 2014 by JCEverson. This entry was posted in bodybuilding, ifbb, IFBB PRO, NPC and tagged be great, believe in dreams, bodybuilding, figure pro athlete, fit over 40, girls that lift, ifbb, ifbbpro, Inspirational, mexcian bodybuilder, modivation, NPC on July 13, 2014 by JCEverson. Team Universe, July 4-5, 2014. I may not have been sitting in a lawn chair watching fireworks in the sky…but you better believe I made some fireworks of my own on stage. I competed in the 40+, 35+, and open Figure Class A. I won my IFBB Pro card in the 35+ division. The entire trip was FABULOUS. We drove to New Jersey from North Carolina, and in between my napping, Papi (my awesome Fireman Hubby) and I discussed the upcoming competition. I didn’t diet down as hard for this show, allowing me to come in a little fuller…which is what he said I needed to do to win, and he was right. I ate every 2 hrs when my alarm went off, despite not being hungry. I loved the road trip, with my 3 chihuahuas sleeping soundly on my lap, and my biggest fan at the wheel. Prejudging on Friday went very well. I made 1st call outs in all 3 divisions. And I was in 2nd position for both masters divisions…with the same competitor in 1st. And it appeared I was in 4th for the open. I was super impressed with myself for that, because those young ladies were on fire! Stiff competition for sure. So anyone who competes knows how you play all this out in your head. It was my first 2 day show, so I had a whole evening, night, and morning to think about it. A pro card goes to 1st in each class…Melissa was 1st in 40+ and 35+…if I am in 2nd…she gets her pro card in 40+…I get my pro card in 35+. Papi did his best to keep me focused and happy. The team meeting on Saturday wasn’t until 4pm. So there was no rush…woke up, ate, Papi tanned me, and I relaxed. As we drove to the competition, the excitement started to kick in. I’m not gonna lie…I could feel that it was my time. I had so much fun with the other competitors back stage. I even rapped my “get pumped” song to a room full of people…it made everyone laugh. So it was totally worth making a fool of myself. Then it was time for 40+ division. Standing on stage as they called out 5th, 4th, 3rd, and then in 2nd place – Jennifer Everson. It was at that moment I knew…in about 15 mins, I’m going to be an IFBB PRO!!! With the biggest smile ever, I walked to the back, put my trophy in my bag, and went back to get ready for 35+ division. 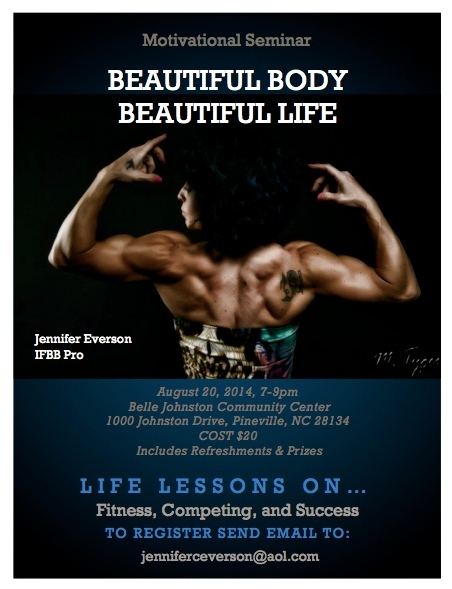 And then they called top five winners, announcing your new IFBB Pro – Jennifer Everson. I was so excited I almost jumped up and down…but contained myself. As soon as we walked off stage, I ran out to find Papi. We embraced and he told me how proud he was of me…and then I had to get back in the line up for the Open Class A. I got 4th and was super happy with that…as I am old enough to have most of them call me MAMA. As if becoming a pro was not enough, I got to meet my bodybuilding idol Bev Francis. 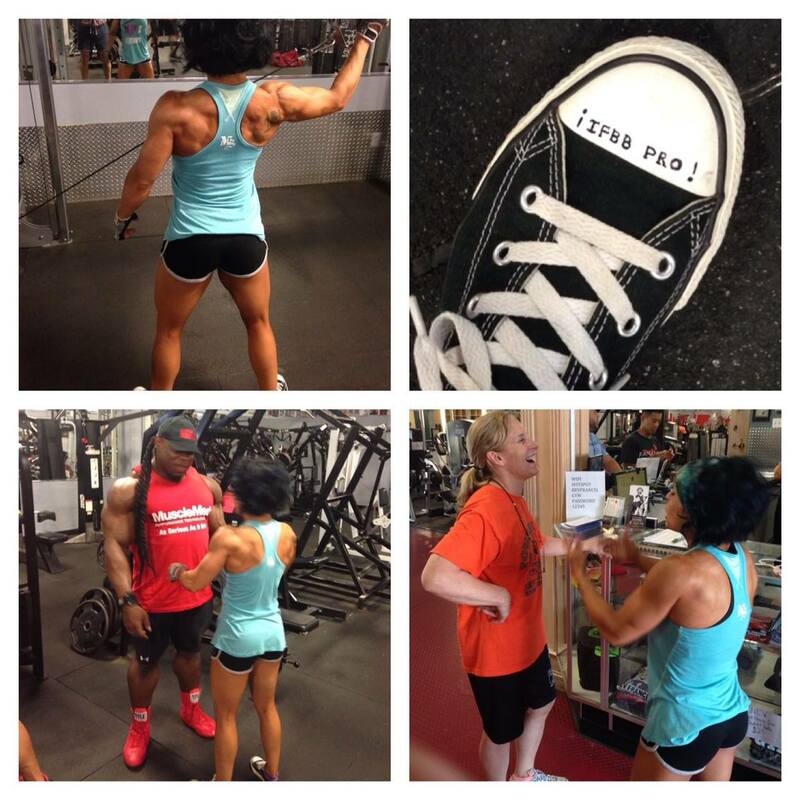 And on Monday, we went to work out at her gym East Coast Mecca/Powerhouse Gym…and who was there? None other than the KIA GREENE! I would have never thought I would be where I am today. But here I am. Confident in my journey…for I left no stone unturned. Last August when I started all of this, I was unsure of where this road would lead, but Papi knew. And so he pushed me. He believed in me. He supported me. I may have only been competing for less than a year…but I assure you I had prepared for this my whole life. Looking back at the days of lifting weights in my garage in high school while everyone else was going out…it was 25+ years in the making. As I write this, I hope that any bodybuilder, male or female; young or old; never stops believing in how great they can be. This entry was posted in bodybuilding, IFBB PRO, NPC and tagged be great, Bev Francis, bodybuilding, figure, fit over 40, girls that lift, girls with muscles, IFBB Pro, Inspirational, Kia Greene, Masters, Mexican Bodybuilding, NPC, Team Universe on July 11, 2014 by JCEverson. A piece I created April 2013. Our wedding rings. This is the first day of my life. I made this out of my husbands old work shirts. He is a fireman. Santa’s Little Helper, LLC. Holiday Lighting & Decorating. Filled with confetti…Mexican tradition to hide, find, and crack on someone’s head! Made this for my 1 1/2 lb chihuahua. Made from recycled shopping bags. Santa’s Little Helper, LLC. That is my company, we do Holiday Lighting & Decorating. Made the silver rings to go around the gold one, which was our Huelita’s wedding ring. I put her children’s initials on the inside. Made it for my daughter. Made it for my nephew. National Arts Council 2012 entries. if it comes from a plant, eat it…if it’s made from a plant, don’t eat it.